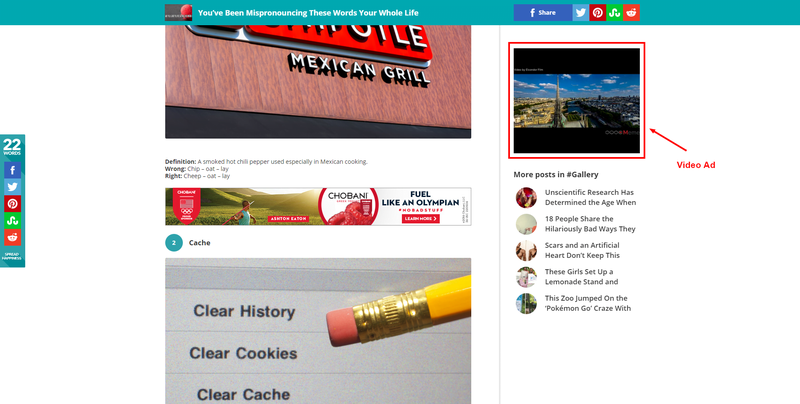 When you think of an online ad, you may picture a little square in a sidebar. Maybe you picture an image at the end of an article you’re reading. Or maybe you imagine a video ad at the start of a YouTube video. All ads are not the same. In fact, there are a wide variety of ads you can come across online. In this section, we’ll talk about common characteristics of ads and the most common types of ads. Now when you’re faced with an ad popping up on your page, you’ll actually know what it is! First, ads can vary in size. There are some standard sizes, but there’s still a lot of variation in ad sizes across the web. The most common ad sizes are 300×250 pixels and 728×90 pixels. Because these sizes are the most common, they have the most demand. This means they will typically be worth more money than non-conventional sizes. Ads that are more engaging also tend to pay more. But ads will perform differently depending on a website’s layout, readers, and approved providers. There is also a lot of variation in the type of advertisements that are served online. Display advertising has evolved beyond the basic banner ad. Alternative ad types are becoming more and more popular. Many of these new ad types are more aggressive in trying to get your attention. (Think about those ads that take over your entire screen!) Here we’ll talk about the different types of ads, from the tamest display ads to the most in-your-face rich media ads. Display Ads – Most of the ads you see online are display ads. Just through Monumetric, our publishers serve 1.5 billion display ads a month. Display ads promote some type of product or service. The ad is usually a static image. It may also contain sound or an in-banner video. Display ads can contain Flash ads that have some type of movement, animation, or interactivity. A display ad has a designated spot on a webpage. If no ad fires, there will be a blank spot on the page. Native Ads – These are designed to look like your site. Native ads follow the design of your website and look like they are part of your content. These ads inherit all of your CSS themes, so the ad will reflect the colors and fonts of your website. Advertisers hope that by having the ad look like part of your site, visitors will be more likely to click on it. Most native ads are strictly pay per performance. This means that as a publisher, you will only be paid when a visitor clicks on the ad and leaves your site. Video Ads – A video ad is just what it sounds like: an ad that’s a video! Video ads are currently the fastest growing advertising format. Video has become increasingly popular because of advances in technology. Computers have gotten faster so serving video ads has become more efficient. Video ads also perform well on mobile, so the recent increase in mobile traffic has helped video ads gain popularity. Advertisers love video ads because they have movement and sound, so they’re great at engaging with a viewer. There are two main types of video ads. The first is called a pre-roll ad. This video will run before you watch the actual video content. YouTube frequently shows these pre-roll ads before you watch a video. The other type of video ad is called an in-banner video ad. This is a video ad that runs in a display slot. If you see a little square video on the side of a news article, that’s an in-banner video ad. Video ads pay more than display ads because they have higher engagement. Rich Media Ads – Rich media ads are at the leading edge of online ad technology. These ads are much more advanced than display ads. Rich media ads look at different ways to use a web page. They have motion or some kind of animation. 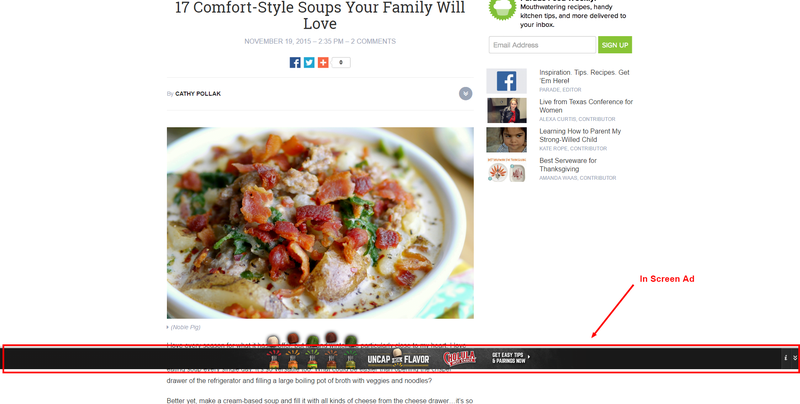 Rich media ads can be Flash based so they move around, or they can take up blank space outside a sidebar. Most of these ads use some type of technology to measure the best place to advertise. Rich media ads are very aggressive when it comes to getting a reader’s attention. An ad like this may move over the page by dropping down or rising up.When a viewer’s mouse passes over the ad, it may change. As ad technology advances, we’ll continue to see new forms of rich media. These pay well because they’re great at grabbing a reader’s attention. But as you can probably guess, some readers don’t love the distraction on a page. Rich media ads pay well but aren’t used as frequently as display ads because they lower the user’s experience on a site. Interstitials – Interstitials are another type of ad that are aggressive when it comes to getting your reader’s attention. These ads overlay on top of the content, so as a viewer you have to see the ad before you see the content. Interstitials often use video. An example of an interstitial is a full screen popup that covers the reader’s whole screen. 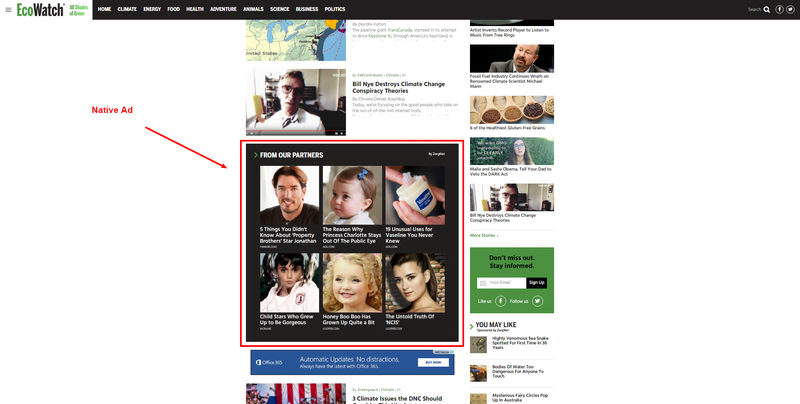 Advertisers are willing to pay a lot for these ads because it forces the attention of the reader to be on them. Because of the attention grab, the frequency that interstitials appear is usually capped. You can control how often they fire. Maybe every user only sees one interstitial, or maybe they see one every 24 hours. Although these ads are aggressive, they don’t negatively impact your traffic. Readers are usually interested enough in the content that they will simply close out of the interstitial and remain on the page to read the content. Anchored Units – Anchored units stay at the bottom of the reader’s screen while they scroll. As a reader is scrolling down a page, the ad is always visible. Because these ads are easy to see and are seen for a longer period of time, they pay more than standard display ads. These ads are called by several names including anchor units, in-screen units, and catfish units. Editorial advertising – Editorial advertising is when a publisher essentially allows a guest video on their website. That guest video will play pre-roll ads and the publisher is paid a revenue share from those ads. You can think of this as if you’re hosting a TV show on your website and you get paid for the TV commercials. With editorial advertising, you have a direct relationship with the advertiser. 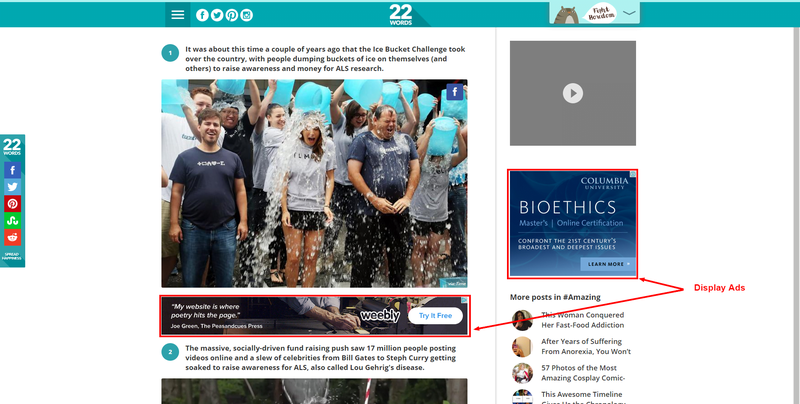 Viewability is an important metric for these types of ads. In-line – In-line ads are designed to appear within content. 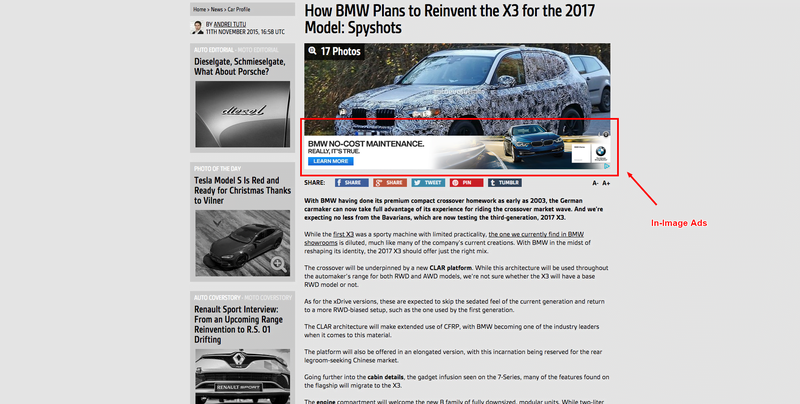 In-line ads include anything that is inside the main body column of a page. That means if a native ad is in-line, it is also considered an in-line ad. In-image ads are technically in-line. Out-stream videos are also included in this category. This means you are streaming a video from an outside source and the video is played in-line. Essentially, any type of ad that appears in the body column of a page can be considered in-line. An example of an in-line ad is when a visitor reads and scrolls down a post and an ad opens between a break in the content. Advertisers hope that these ads will be seen more than a standard display ad because the reader’s eyes are already on the content. In-image – These ads appear at the bottom of an image. In-image ads only cover a small part of the image so it’s is still clearly visible to the reader. Usually the bottom 50 pixels of an image is covered by the ad. All in-image ads have a “close” button so users can close the ad to see the entire image. In-screen – In-screen ads try to remain in the reader’s line of vision for as long as possible. These ads stick to the bottom of the page and stay there as the reader scrolls. The ads remain in the reader’s line of sight until they close the ad or go to a different page. Because these ads are clearly visible and are seen for longer amounts of time, they pay more than display ads. Malware – Malware is not a type of ad unit. Instead, malware hijacks the ad call process and uses it to serve malicious code. Unfortunately because the online ad industry is so huge, malware can sneak through and end up on your page. The most common type of malware that interferes with the ad call process is called a redirect. When someone buys an ad, a genuine advertisement is not served. Instead, a piece of code is placed on the website that redirects the user to some other place on the internet. The purpose of a redirect is for the seller to gain illegal traffic. Selling a redirect is fraudulent (and illegal) because the publisher is selling a space for an advertisement, not a redirect. For more information on malware, visit the Fraud section.